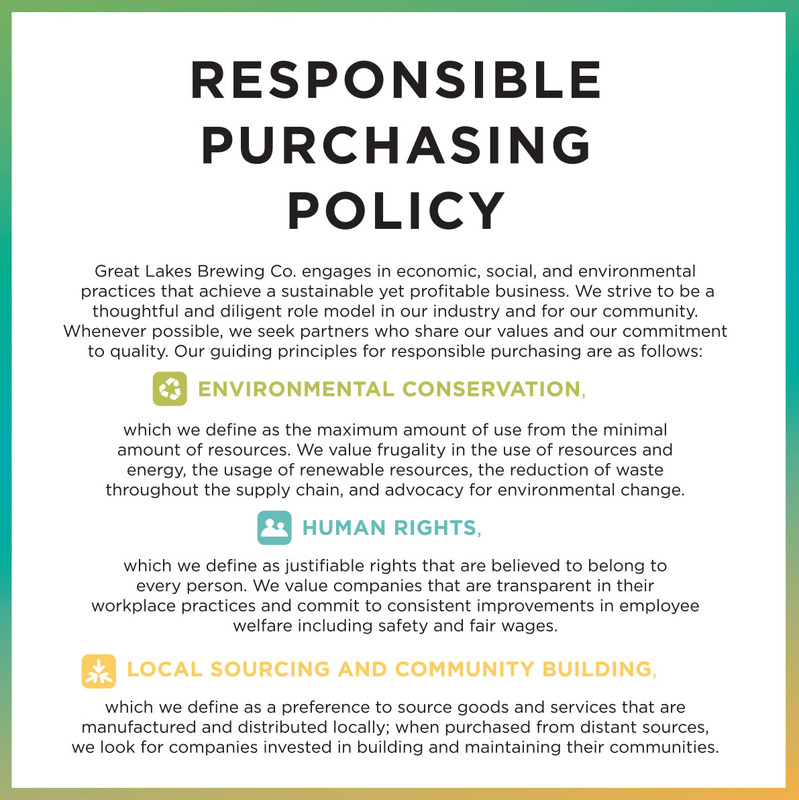 Thank you for shopping with Great Lakes Brewing Company (GLBC). We want you to be fully satisfied with your order. Please read these guidelines about our policies. If you have questions regarding your online order, please contact the GLBC Online Store Customer Service Team by email at onlinestore@greatlakesbrewing.com or by phone at 216.771.4404, ext 846 Monday through Friday between 9AM and 5PM (EST). After you place an online order, you will receive an order confirmation and a shipping confirmation e-mail (after the item has shipped). Make sure that glbcinfo@greatlakesbrewing.com is marked as a safe address so these emails do not go into your spam folder. Due to the custom nature of our fulfillment process, we cannot cancel or modify an order once it is confirmed. It is your sole responsibility to confirm the accuracy of the order–quantity, sizes, ship to addresses, and all other order information–prior to submitting your order. GLBC’s online store accepts GLBC Gift Cards, Visa, MasterCard, and Discover. Sales tax will be charged to all orders delivered to the state of Ohio. A $3.50 flat shipping and handling rate (plus tax where applicable) will be added to all "gift card only" orders. Orders that include gift cards and additional merchandise will not have the $3.50 charge (i.e., regular shipping charges will apply). Upon receipt of your order, please thoroughly inspect the carton(s) for any damages that may have occurred during shipment. If the item is damaged due to shipping, please contact the shipping provider immediately. If your order was shipped via UPS, call the UPS helpline at 1.800.742.5877 to speak to a UPS representative. If your package was shipped via USPS Priority Mail, you will need to bring the entire package to your local post office and follow their instructions. Please keep all packaging as proof. If you receive an item in error or your order is shipped incorrect, please contact the GLBC Online Store Customer Service Team ASAP. Once the error is confirmed, we will ship you the correct item(s). GLBC will provide a prepaid return label with the correct item. If we do not receive the incorrect item back, your credit card or gift card may be charged for the corrected item and shipment. Returns and exchanges must be made within 30 days of date of purchase and are the responsibility of the customer. Authorization must be confirmed by a GLBC Online Store Customer Service Representative before a credit or exchange can be issued (call 216.771.4404, ext. 846 or e-mail onlinestore@greatlakesbrewing.com). If eligible for a credit, the customer will receive the credit reduced by a 15% restocking fee. All credits will be charged back to the card used for the purchase. For items ordered with a GLBC Gift Card, GLBC will issue the customer another GLBC Gift Card in the amount of the credit. Sales tax will be credited on all orders delivered to the state of Ohio. Returned and exchanged items should be returned via a traceable method. Any items returned without any means of tracking or delivery confirmation are unauthorized. Items must be returned in their original condition: unworn, unwashed, and undamaged. Items that have been monogrammed or personalized cannot be returned or exchanged. Discontinued, clearance, and out of stock items cannot be returned or exchanged. Customer must include a copy of the order confirmation with all returns and exchanges noted. Credit will be issued once item is returned in its original condition (condition subject to review by a GLBC Online Store Customer Service Representative). Please allow 1-2 business cycles from the day the item is returned for the credit to be issued. Exchanges are only to be made for like items (e.g., different color, different size). Exchanged items will not be shipped until the item is returned to GLBC in its original condition. Due to the custom nature of our fulfillment process, another online order must be placed to receive exchanged goods. Contact the GLBC Online Store Representative for complete details. Returns and exchanges for items purchased online cannot be accepted in the GLBC onsite Gift Shop in Cleveland or vice versa. Gift Cards cannot be returned or exchanged. GLBC does not accept C.O.D. deliveries. Policies subject to change without notice. ENVIRONMENTAL CONSERVATION, which we define as the maximum amount of use from the minimal amount of resources. 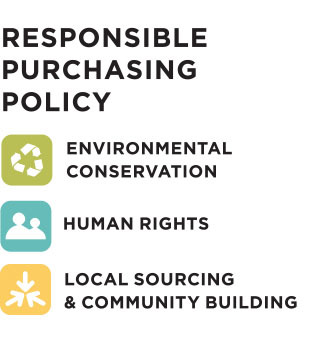 We value frugality in the use of resources and energy, the usage of renewable resources, the reduction of waste throughout the supply chain, and advocacy for environmental change. HUMAN RIGHTS, which we define as justifiable rights that are believed to belong to every person. We value companies that are transparent in their workplace practices and commit to consistent improvements in employee welfare including safety and fair wages. LOCAL SOURCING AND COMMUNITY BUILDING, which we define as a preference to source goods and services that are manufactured and distributed locally; when purchased from distant sources, we look for companies invested in building and maintaining their communities.